Compensation paid to drivers in Northern Ireland whose vehicles were damaged by potholes and other road defects has more than doubled in the last two years. The amount of compensation rose from £321,849 in 2016 to £751,926 in 2018. The figures were obtained by BBC News NI under the Freedom of Information (FOI) Act. It comes as a public spending watchdog warned it would cost more than £1bn to deal with structural maintenance. The Northern Ireland Audit Office (NIAO) has published a report highlighting how a lack of investment is having a deteriorating effect on the overall condition of Northern Ireland's road network. Is our pothole problem getting worse? 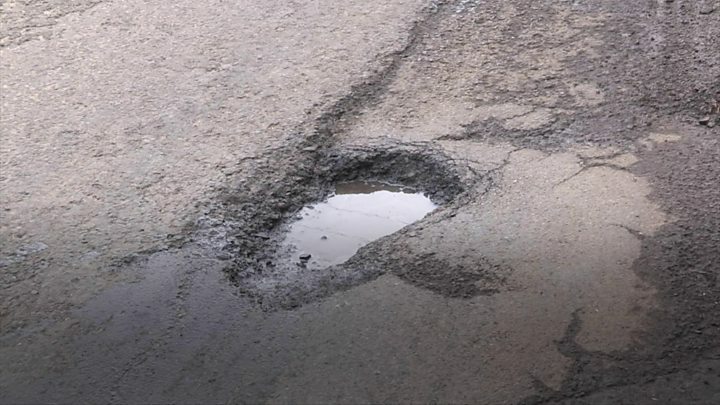 The Department for Infrastructure said the audit office report highlighted that funding for road maintenance has been below the level required for a number of years. A spokesperson said it identified the need for "planned, timely, targeted intervention". In its report, the audit office estimates it will take £1.2bn to clear the backlog of structural maintenance across Northern Ireland. Auditor general Kieran Donnelly said: "We're about £50m short every year. "We're spending in Northern Ireland about £90m on average a year on road maintenance, we would need to spend on average about £140m just to stay level, to keep the roads from deteriorating." He added: "It's not just damage to vehicles, it's also personal injury claims as well and they're running around £4m per year at present. "The experts say that the actual patching reactive maintenance should only be about 10% of the budget, but in Northern Ireland it's been consistently a lot more than that, more like 30%." Mr Donnelly said that 4,000 claims for vehicle defects were made in 2017/18. The FOI statistics on the number of road defects across Northern Ireland were released to BBC News NI by the Department of Infrastructure. Road defects include cracks and potholes recorded on carriageways, hard shoulders and lay-by surfaces. The data shows that in 2018, there were 127,173 road defects recorded across Northern Ireland, an increase of 60,000 on the previous year. It also confirmed that the number of successful vehicle damage claims rose from 1,590 in 2016 to 3,533 in 2018. The road with the largest number of defects (162) in 2018 was the Ballyfannahan Road in County Armagh. This was followed by the Hillhead road in Ballyclare (147) and the Upper Dromore Road in Warrenpoint (145). "Road maintenance is rarely a vote winner when compared to high-profile bypasses and dual-carriageways," said roads expert Wesley Johnston. "Yet, today's pothole figures illustrate what happens when not enough is spent fixing our roads." The audit office report published on Tuesday found that reduced funding for Northern Ireland's road network had led to a significant reduction in the number of potholes which are recorded and approved for repair. Mr Johnston believes additional funding is the only way to address the problem. "Unless maintenance funding is increased, this problem is only going to get worse. But the money has to come from somewhere, so it could mean fewer badly-needed road upgrades are provided," he said. "Politicians, or civil servants in their absence, have some tough decisions to make." Members of the public can report a pothole on the government's NI Direct website and view a live interactive map of the location of all potholes reported throughout Northern Ireland.